The old church in Insch was dedicated to St Drostan, a relative of St Columba who is said to have brought Christianity to this part of Scotland . We do not know when the first church was built in Insch. The lands of Insch in the twelfth century belonged to David, Earl of Huntingdon and the Garioch. As a thank offering for his return from a crusade he founded Lindores Abbey in Fife and gave his lands in the Garioch for its upkeep. In return the Abbey had to provide a church for the people of Insch. There is a long coffin slab in St Drostan’s Kirkyard in High Street by the gable wall of the old church which is one of the oldest lettered stones in Scotland. The inscription (said by some authorities to be in Irish characters) – “ Orate pro anima radulfi sacerdotis” with a Maltese Cross below. “Pray for the soul of Radulf, the priest”. This is probably the gravestone of Radulf, a Chaplain of the Bishop of Aberdeen who witnessed a grant of land in the parish of Rayne to the convent of Melrose about 1172 - 99. One expert says that Radulf was probably Bishop of Aberdeen for 8 years and died in 1247. So there seems to have been a graveyard in the area by that time. There is a list of ministers from 1567 recorded at the back of a minute book 1923 – 1983. St Drostan’s Church, High Street. One of those ministers, Mr. Calderwood, appeared in a cartoon in a church bulletin dated the 4th December 1945. Under it was a paragraph about his reputation as a keen walker. He was known as “The Walking Parson.” The article stated, “He likes to tell this story against himself - at Insch he found territory after his own heart for walking. Two of his parishioners saw him set out one day. ‘The new Minister’s an awfu tramp,’ said one, admiring his prowess. ‘Thirty miles a day is naethin tae him. He maun hae tae guid feet.’ The other, less ardent in her admiration, sniffed and said, ‘Aye, that end o him seems aa right!” The same can be said of the present minister who is often to be seen walking with or without her two labradors! St. Drostan's Church, High Street gable with its bellcote remains in the kirkyard in High Street. It has the date 1613 on it and MJL the initials for Minister John Logie. It served until 1882 when the building was condemned. At the Kirk Session meeting in the public hall on the 1st of December 1883, the minute states, “The Session recorded their gratification that the new Church was now occupied by the congregation.” The present Insch Parish Church has four beautiful stained glass windows along one wall side and another two beautiful stained glass windows from Oyne Church have been cleverly hung on the front inside wall of the church. These two windows have lights behind them which, when switched on, show the colours to their full glory. The Church Hall, opened in 1901, is situated directly across from the Church. Insch West Church (United Free Church) was built in 1852. Insch West Church and Insch East Church united in 1940 after which the building was used as an egg grading station, and was sold in 1947. The site is now the fire station. Leslie Parish Church was built in 1815. Gifted to an earlier Leslie church and now on loan to Aberdeen Art Gallery is a set of communion beakers made by James Penman in Edinburgh circa 1685. The beakers are engraved with a vine and the inscription “I am the vine and ye are the branches. The blood of Jesus Christ cleanseth all sin. Without shedding of blood there is no remission.” The Latin inscription underneath can be translated as, “This cup was dedicated here in the words of the Lord for the use of the church in the Eucharist by William Watson, Leslie, 1688.” William Watson was the Minister of Leslie (1696 Poll Book). These beakers were valued at £500 each or ‘very much more’ in 1967 when they were offered as a loan to Aberdeen Art Gallery. There is some evidence of there being a small church in the graveyard at Premnay, with an old stone, possibly a gable stone built into the graveyard wall. Also within the manse was found an old piece of wood, possibly the top of a door with 1667 carved into it and the letters JW. Premnay Parish Church was built in 1792. 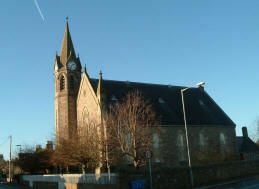 Last Service was held there on 9 May, 1993. The building is now a house. Premnay and Leslie Churches had held combined services since the 1950s and in March 1973 the two churches were united. St Ninian’s Church, Oyne was the Parish Church built in 1807, and the last service was held in 1940. West Church of Oyne was the United Free Church in Oyne. They united in 1940, after which St Ninian’s was sold for agricultural use, and was used for that purpose for many years until a fire destroyed much of the building, though the ruin remains. West Church became Oyne Parish Church. It was linked with Rayne for a few years, then linked with the united congregations of Leslie/ Premnay. It was closed for worship in December 1988. The church is now a house. In 1983 the congregations of Leslie/ Premnay linked with Oyne were united with Insch.